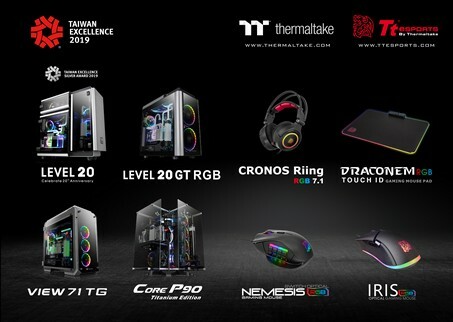 Taipei, Taiwan － November 13th, 2018－ Thermaltake and Thermaltake Gaming Tt eSPORTS won the “27th Annual Taiwan Excellence Award of 2019” for 9 amazing products, marks Thermaltake’s 8th consecutive victory in a row. These nine awarded products all reached the high specifications of the Taiwan Excellence award, including the degree of R&D, design, quality, and marketing. 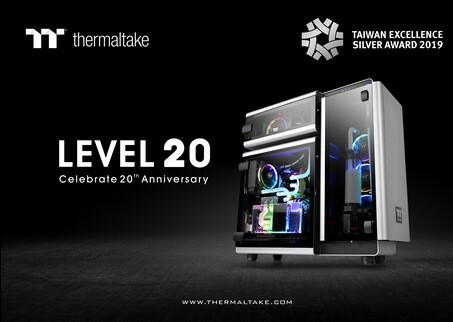 This year Thermaltake encountered fierce competition; competed against a total of 1,127 entries worldwide and faced a 140 member jury panel, and we are honored to earned the Taiwan Excellence Silver Award with Level 20 Tempered Glass Edition Full Tower Chassis, which was selected from top 30 entries out of 1,127 products. 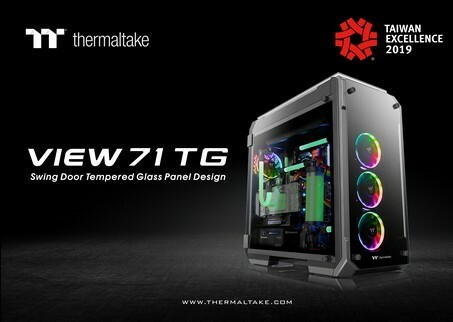 The judges were impressed by the innovation, cutting-edge technology and unique design found in the Thermaltake products, including: Level 20 GT RGB Plus Edition Full-Tower Chassis, View 71 Tempered Glass RGB Edition Full Tower Chassis, Core P90 Tempered Glass Edition Mid-tower Chassis and Level 20 RGB Mechanical Gaming Keyboard TT Premium Edition. 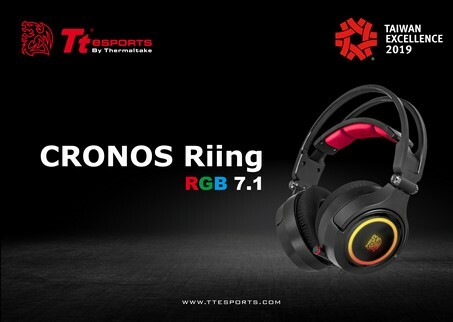 Tt eSPORTS won the award with the Iris Optical RGB Gaming Mouse, NEMESIS Switch Optical RGB Gaming Mouse, CRONOS Riing RGB 7.1 Gaming Headset and DRACONEM RGB Touch Edition Gaming Mouse Pad. 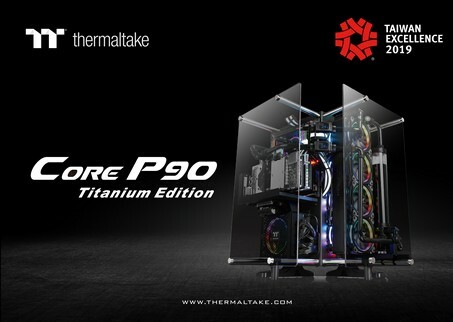 Moreover, Thermaltake has 50 products won the Taiwan Excellence Awards thereby earned the Taiwan Excellence Achievement Awards of 2019. It features a gaming oriented design with architectural aesthetics, the aluminum-made Level 20 utilizes an aerodynamic trio chamber structure to achieve ventilation and space management optimization. The three hinged swing-doors are made with premium-quality 4mm thick tempered glass windows that provide durability and superb viewing capability. The Level 20 is installed with latest USB 3.1 Type-C port to provide 10 GB/s of transmission speed. Furthermore, the three built in Riing Plus 14 RGB Fans, two Lumi Plus LED Strips and one Riing Plus Digital Controller can all be controlled with the TT RGB PLUS Software. Users can custom control fan speeds and lighting effects to create their own unique liquid cooling gaming system. Compatible with the latest PC hardware, AIO and DIY liquid cooling solutions, the commemorative Level 20 Tempered Glass Edition Full Tower Chassis delivers not just an unprecedented design but also innovative performance. Level 20 GT RGB Plus Edition Full-Tower Chassis shares most of the same traits with the RGB Plus Edition, including four tempered glass windows with hinged door, smart lock designs, latest USB Type-C™, USB 3.0 I/O Port and offers high-end complete solution. However, it preinstalled with two Riing Plus 20 RGB and one Riing Plus 14 RGB fans, which can be controlled by TT RGB PLUS Software, allowing users to custom control fan speeds and lighting effects, and the chassis is able to be compatible with the latest PC hardware, AIO and DIY liquid cooling solutions. The chassis utilizes swing-out side panels, and is enclosed in 4-side 5mm tempered glass (left, right, front & top) for users to demonstrate their DIY handiwork and enjoy the ultimate internal component visibility. It is preinstalled with three 140mm Riing RGB fans for outstanding ventilation, and its seven drive trays with modular drive racks deliver advanced storage capacity and liquid cooling expansion. With supports for the latest PC hardware, the View 71 Tempered Glass RGB Edition Full Tower Chassis is not only fascinating in appearance, and when it comes to performance, the only thing that will limit its capabilities is users imaginations. Core P90 Tempered Glass Edition Mid-Tower Chassis boasts the case architecture split into three compartments for graphic card, PSU and other cooling components. The triangular prism shaped body and two 5mm thick tempered glass side panels turn the chassis into a hexagonal prism outlined creature. Along with its 3-way placement layouts (wall-mountable, horizontal laying and vertical standing), it delivers high installation flexibility for a revolutionary system display from every angle. The interior space for custom cooling loop is maximized thanks to its “3+2” HDD mounts inside the right-side panel and two 3.5”/2.5” HDD compatible brackets behind M/B tray. With supports for up to three 140mm fans, one 480mm radiator and for the latest PC hardware, AIO and DIY liquid cooling solutions, the Core P90 TG permits users upgraded aesthetics and limitless potential with how they want to configure their systems. The Level 20 RGB Mechanical Gaming Keyboard TT Premium Edition has aluminum faceplate with unique floating keycap design and Cherry switch. It packed with features including: 5 pre-configured FPS1, FPS2, MMO, MOBA, RTS lighting zones, 100% anti-ghosting, on-the-fly macro system, built-in 4-pole audio and USB device. Moreover, the keyboard has dedicated volume/mute and multimedia controls which allow users to adjust as needed. For the look, it offers 13 lighting effects in keycap area and 14 side lighting effects. 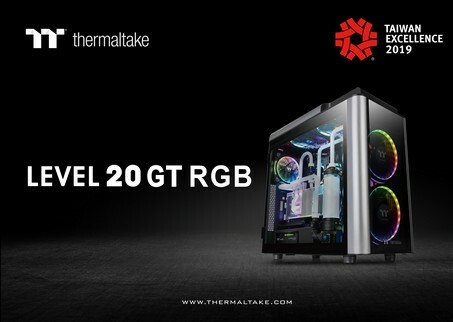 Also, it is exclusively compatible with all Thermaltake TT RGB Sync Power Supply and Liquid Cooling Solutions and any other product range sporting the TT RGB Sync logo, enabling enthusiasts to sync all RGB colors seamlessly to all Thermaltake compatible product lines for even greater color coordination. In addition, the Level 20 RGB comes with an exclusively designed smartphone/tablet app with voice controlled AI for access to light functions and can adjust macro setting and lighting effect with the app. The app also includes an exclusive patented designed Virtual Game Controller (VGC) mode for a truly unique and astounding mobile gaming experience. A new high performance entry-level mouse equipped with customizable 16.8 million RGB color, 9 dynamic lighting effects and exclusive side aura illumination. 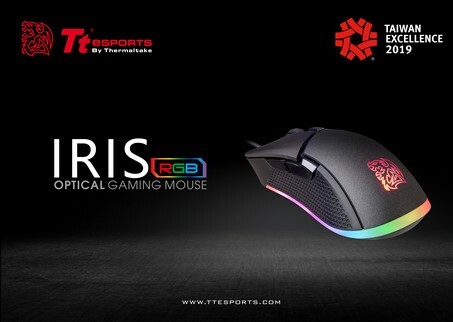 The Iris Optical RGB also comes with a gaming grade sensor that supports up to 5000 DPI, 20-million-click gaming grade switches for maximum durability and new gen gaming software for macro, advanced performance, light and profiles settings. Light up the battlefield with the Iris Optical RGB and play with superior accuracy, tracking, and ergonomic comfort. 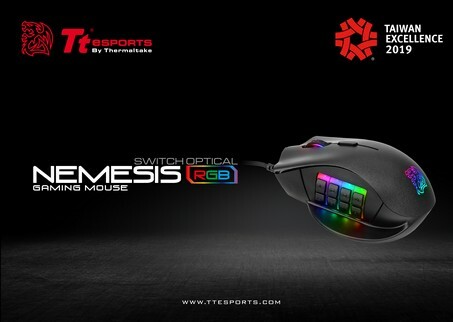 NEMESIS Switch Optical RGB Gaming Mouse features exclusive patented key switching system is now available to purchase worldwide. Enthusiasts can customize up to 12 switch keys to suit different playing styles, hand sizes, and for enhanced ergonomic comfort. The use of Japanese branded OMRON switches with a 50-million click lifespan provides durable, consistent, and accurate tactile feel with each click for maximum responsiveness; and the use of a high quality gaming grade PMW3360 optical sensor with up to 12000 DPI provides precision gaming to enthusiasts, whilst the utilization of 16.8million RGB colors lets users light up their battles. Users can also use the downloadable software to further customize macros, lighting effects, colors and button controls to suit their playing style to maximize their performance in-game. Packed with latest tech features: an oversized 50mm state-of-the-art tilting neodymium driver, 16.8 million color RGB illumination with 8 different lighting effects, and the latest 7.1 premium virtual surround sound technology to offer the most immersive 3D sound experience to ensure you hear all sounds with pinpoint accuracy for that all-important competitive edge. 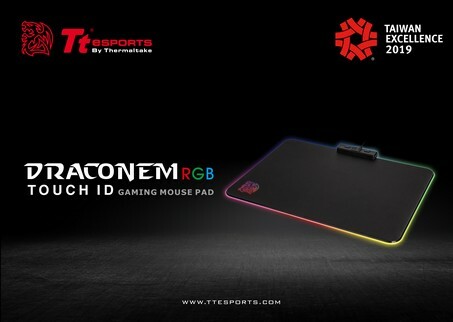 Equipped with 16.8 million RGB color illumination, 4 stunning lighting effects, coupled with a completely new left, right and bottom design construction, gives the mouse pad even greater color illumination than ever before. The surface for the mouse pad is specially optimized and creates play that is balanced for both speed and control. The highlight feature, a state-of-the-art biometric FIDO certified Touch ID System, which allows for easy login to PC systems, access to favorite web pages, and secure file and folder encryption. In addition, enthusiasts can further customize their desired lighting settings with both hardware and software controls for even greater color personalization.